» Best picture quality with 6 megapixels! » Best picture quality with 6 megapixels!. It’s not true(!!! ), we have to say when it comes to compact cameras. We, the staff of Image Engineering which is an independent testing laboratory that, amongst other things, tests digital camera for the German magazines Color Photo and c’t. Quite a while ago we noticed that the image quality of digital cameras was getting worse instead of better. The reason is that today’s sensors are divided into more and therefore smaller pixels. We want to clarify the consequences on this website. A good look at the Megapixel Myth. More is not better. I've noticed this in a lot of the cheap P&S cameras. 12MP on a teeny tiny sensor just does not work. Given their calculations, APS sized DSLRs should be able to go 37 MP. However, the small cell phone sensors should have stopped at 2.7MP. This is the coolest thing I've seen on the Internet in a long time. Mark is checking to see if it works on the Wii browser. It'll be a cool party trick if it does. There is also a 2D interface but I think the 3D is much cooler. When shooting a stop motion video, check the focus on the camera every so often and tape the focus ring so it won't move. Went to see the Alamo City Roller Girls on Sunday evening with Mark, David, and Edmo. The undefeated Dragon Divas vs The Missyfits. I'm assuming the Divas won as they were ahead when Hannah and I left. [update!] As Ed comments below the Missyfits made a comeback in the last period and won by 4! Now I wish we'd stayed for the end. 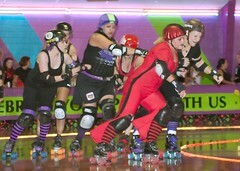 The next bout is July 15th: "Celebrating Our Bill of Fights" with the Prim Reapers v. Missyfits. My daughter has already put in a request to go. Talk about a challenging environment to shoot photos. Everywhere you point there are bright somethings behind the subject. Neon, flashing lights, colored incandescent, bright yellow lights in a huge diffusing globe, and who knows what else. Fortunately I had the strobe and was able to power through most of the odd colors. I'm glad the new lens performed well. It' would be near impossible to shoot with the kit lens, and limited with the 50mm. For those who care, most of the shots were taken with my cheap Vivitar 5200 strobe at 1/4 power around f4.5 at 1/160th and ISO 1600. Thanks to Noise Ninja for cleaning up the noise for me. I also discovered that a proper exposure at ISO 1600 has less noise than a slightly underexposed shot at ISO 800 on my camera. They attempted to deliver it about 20 minutes after we left for Canyon Lake today so I'll have to go pick it up Monday morning at the PO. In case you're wondering, the lens is a Sigma 24-70mm f2.8 EX. I got it off eBay at a decent BIN price, complete with lens hood and soft case. Steve's Digicams has a review of the Pentax K10D up now! It's available at Amazon now for $919 with kit lens. This is the camera I was set on until Scott offered to sell me his Rebel cheap. It still looks pretty good, but I'd have to take a much closer look before making the choice between it and a Canon 30D. Compare it with the K100D at $545 with kit lens. This is one step above the used Rebel that I bought from Scott and would make a great starter camera for anyone looking at a digital SLR. Don't get caught up in the mega-pixel myth. This will produce large prints just as well as the newer 10MP cameras will. You're better off pocketing the savings and using it later for a cool lens. I'd recommend this 50mm prime for a start. I've started up a Canon store on Amazon just to see how it works.